Cut out all your outdated processes by going digital. No more scanning, faxing, or mailing. Your reps and customers will love how easy it is to approve agreements securely and electronically. Paper is a pain: it takes up space and is easily misplaced. Plus, managers only have access to that paperwork if reps turn it in at the end of the day. With the SalesRabbit software, your reps and customers can zip through a sales transaction using paperless e-contracts. No more paper costs, no more misplaced documents. Go beyond collecting legally binding signatures. 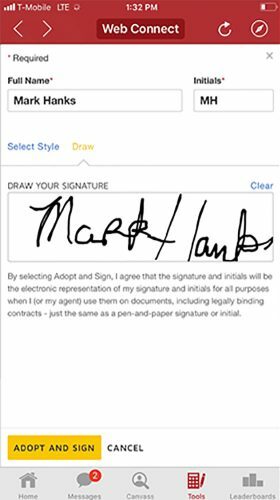 With DocuSign, you can prepare, execute and manage the entire agreement process digitally— from end-to-end. You’ll be able to easily prepare agreements using your existing documents and forms in virtually any file type. You’ll save time with flexible workflow capabilities that allow you to automate and standardize critical processes, with the ability to set the order of steps and roles of recipients of any transaction. And robust data controls help you eliminate data entry errors: pre-populate fields, gather and validate data during signing, and push the data you gather to your own systems. SalesRabbit will show you exactly how the DocuSign connector works for your organization.